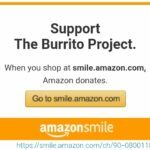 The Burrito Project is a very social & grassroots movement. Feel free to connect with us (The South Pasadena Chapter & Lincoln Heights Chapter) using whichever social media you prefer. We have a facebook fan page with lots of information on upcoming Burrito Project Events. You can even “like” us by clicking below or above. We also have a very new Twitter Feed (which I hope we can keep interesting). We look forward to “following” you as well. Of course, I look forward to working with you in person as we make the world a better place, one burrito at a time.